Increase university enrolment, track and improve student performance and make better funding decisions. Higher education industry is continuously propelled from one rock to another. Its the hot topic for the government. Officials are looking for ways to improve it by reforms however, very less has been accomplished and a whole lot still remains. On the other hand, reducing number of teachers and leaders with required skill set has tipped off the alarm in this sector. Student’s preferences are also changing with new technologies and cheaper mode of learning available such as online learning and other independent non recognised institutes. Thus, students enrolment for professional degrees are mitigating year after year which has reduced the inflow of funds. This situation behooves education institutes to take informed decisions. Improve funds allocation to critical business processes such as marketing and student recruitment. And, adhering to reforms. Detailed and real time visualization of the data can help in achieving the desired outcome. 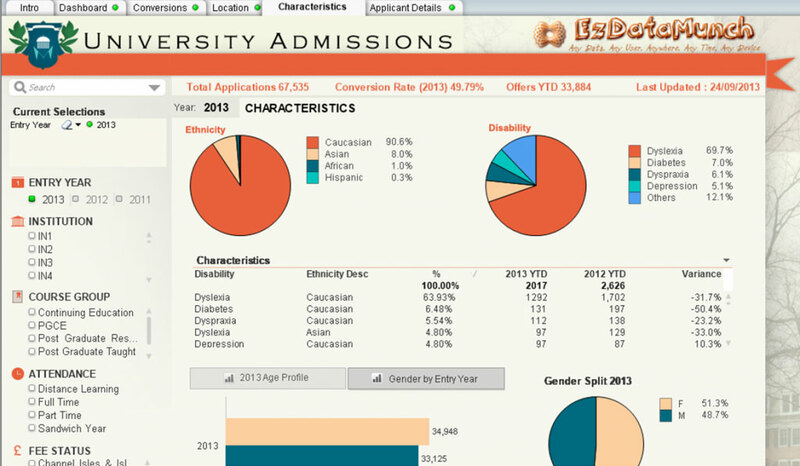 With EzDataMunch pre-built education analytics dashboards, institutes can get real-time insight into student recruitment data, application processes and trends, student performance and more. This insight enables institutes to take informed decision anywhere anytime. 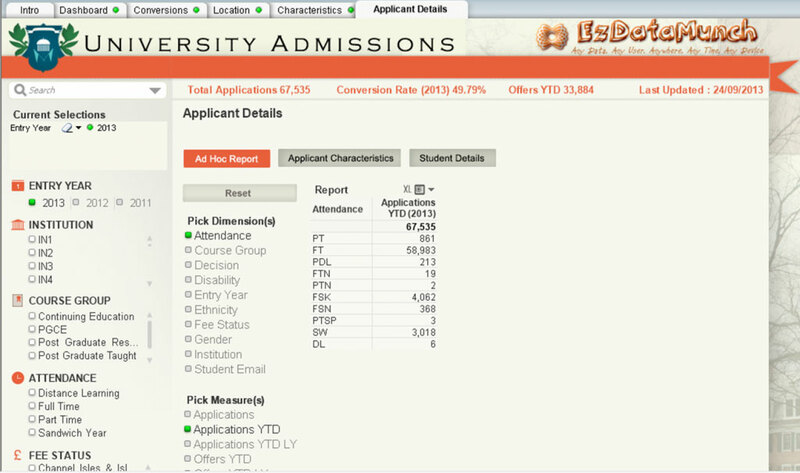 These education analytics dashboards represent complete overview of admission and application process and measurable metrics. Get indepth view of total number of applications received and compare it against total applications offered and total applications accepted. Track trends and analyze growth or decline in applications year over year. Understand the preferred course by students and compare the applications trend as per the course offered. Further drill down by application time line, state, district, class wise information, course group, attendance and fee status. See total conversion rate of all the applications and measure the trend to take informed decisions. This education analytics dashboard gives complete information regarding various characteristics of students’ personality. The variances can be analyzed in pie diagram format. Metrics such as student ethnicity, disease or disability if any, age and gender split data can be viewed with just a click. A-hoc report of education analytics solutions provides multiple dimensions of information to select from. Responsible personnel can drill deeper in student’s information to measure attendance, course, and more. 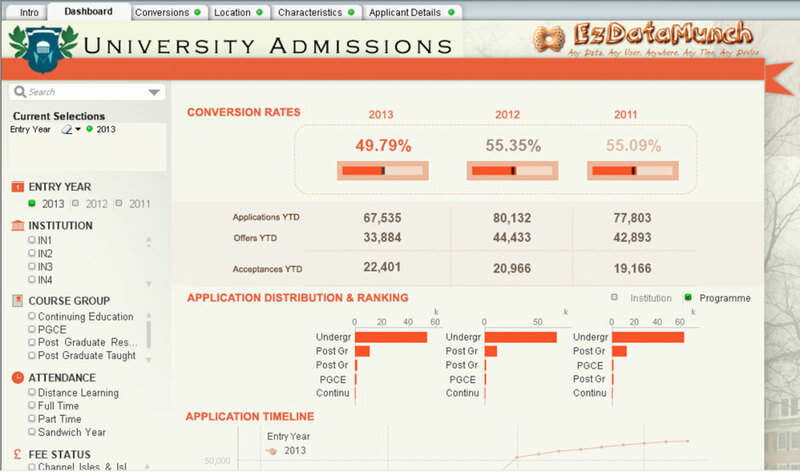 This education analytics dashboard gives institutes an opportunity to dive deeper into student’s application data. 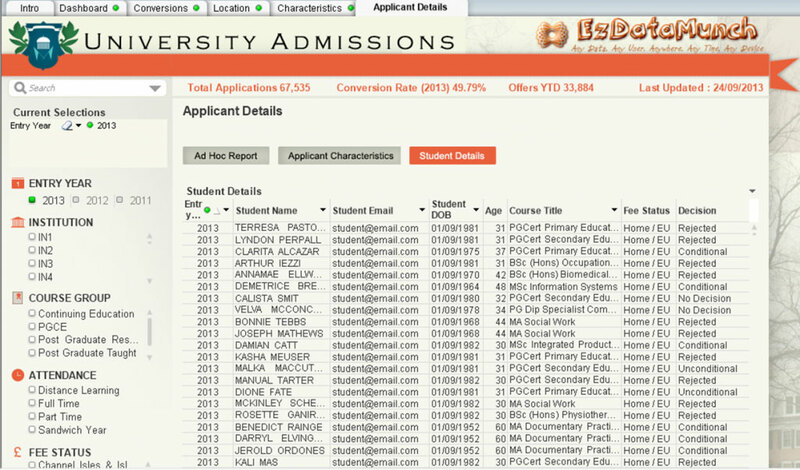 Information such as student name, date of birth, course applied for, email address and fee status can be analyzed. We were struggling to get our arms around spend data. We were using SAP BI and were still in need of a solution that can help our procurement group to analyze spend data more objectively and see how we can manage our indirect spend. EzDataMunch Spend analysis playbooks provided that perfect solution! We were able to load our data in cloud and within a couple of days everything was mapped, analyzed and presented in a user friendly application that we can provide to our procurement team.